Need inspiration for your next rock painting design? 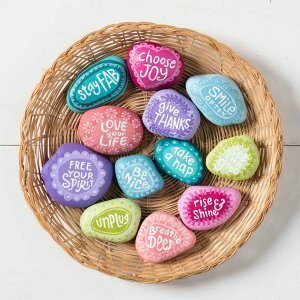 Try inspiring others with an inspirational painted rock quotes! I have included my Top 40 along with over 100 more quotes for your rock painting enjoyment. To get started, follow the instructions for these Feel-Good Painted Rocks DIY from Plaid Online. Quick Tip: Try using Paint Pens for easy writing your special messages on your painted rocks. Click here, for a list of paint pens for your next project. Need more, Inspiration? Check out 167 Inspirational Quotes for Kindness Rocks and Pinterest for more incredible ideas. Now, you have lots of inspiration for your next rock painting project. So, what’s your favorite quote? Let me know in the comment section below. Until next time Rock on!